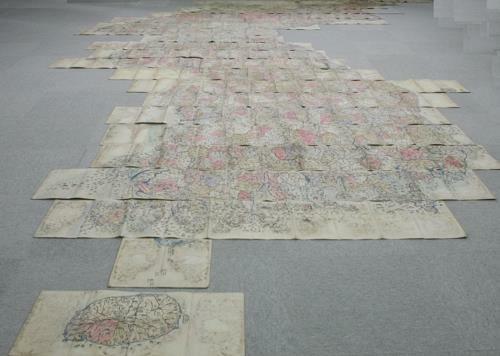 SEOUL, Aug. 2 (Yonhap) — A 19th-century Korean map which marks Dokdo as part of Korean territory was recently found in Japan, scholars from both countries said Tuesday. 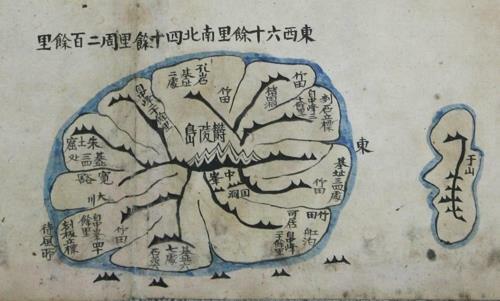 Nam Kwon-hee, a professor at Kyungpook National University, said he confirmed the existence of what appeared to be Dokdo on the right side of Ulleung Island in the East Sea on the colored, handwritten version of Daedongyeojido, a Korean map made by cartographer and geologist Kim Jeong-ho in 1861. The discovery came amid Japan’s repeated sovereignty claims to South Korea’s easternmost islets. The manuscript owned by a Japanese national is estimated to have been created between 1864 and 1889, Nam said. It used to belong to a library in Pyongyang, North Korea, and it is unknown how it was brought to Japan, Nam added. Inside the map remained the library’s serial number and the date it was obtained — Aug. 30, 1932. The discovery resulted from cooperation among Nam, Yukio Fujimoto, honorary professor at University of Toyama, and professor Kim Seong-su from Cheongju University in North Chungcheong Province. The National Diet Library of Japan is believed to possess one copy of the handwritten Daedongyeojido with Dokdo on it and the Research Institute for Korean Studies has another copy, the registered cultural property No. 638. The handwritten Daedongyeojido is an improvement of cartographer Kim’s orginal woodprint version, which didn’t include Dokdo. The newly found map also contains an additional 2,000 pieces of geographical, architectural and historic data absent from the woodprint version.